Kosamba is a city and a municipality situated in the Mangrol Taluka in Surat district in the Indian state of Gujarat. Kosamba comes under Surat Metropolitan Region. 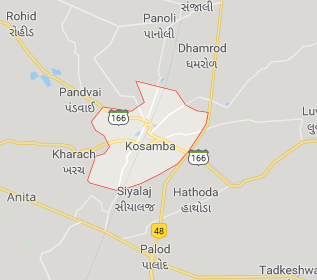 Kosamba consists of the twin towns of (1)Tarsadi Nagarpalika and (2) Kosamba Gram Panchayat. Of these two municipalities, Tarasadi is larger than Kosamba. Though they have independent civic bodies, both are generally known as Kosamba.